Russia has officially notified China of the fact that the production of J11 jet fighters, which copy Russia’s Su-27SK aircraft, violates international agreements. Moscow promised to launch legal proceedings to protect its intellectual property. Russia’s attempts to settle down on China’s arms market have been made to no avail, the Nezavisimaya Gazeta reports. Chinese pirates have entered a new level of activity. They mastered the production technology and developed the Chinese production of Su-27 analogues with a view to subsequently export the planes to third world countries. The military cooperation between Russia and China has not been very successful during the recent couple of years. Russia’s arms exports to China dropped by 62 percent. In addition, Russia does not sign any new defense cooperation contracts with China. For the time being, the two countries simply execute the previously signed contracts, the sum of which total about $1.8 billion. It is worthy of note that China used to be a major buyer of Russian-made military hardware. At present moment, China gradually becomes a large exporter of arms. The Shenyang J-11 is an advanced fighter in the People's Liberation Army Air Force. It is a Chinese-redesigned, Chinese upgrade of the Russian Sukhoi Su-27SK. The new J-11 is a Chinese redesigned version of the Sukhoi Su-27SK air superiority fighter. Sukhoi originally provided kits to Shenyang Aircraft Corporation upon an agreement in 1995, but over time there were to be increasing Chinese content in the aircraft, with up to 70% of all Su-27 ordered by the PLAAF to be Chinese-made. 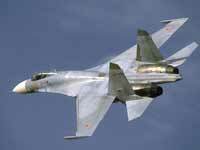 It has been reported that Sukhoi agreed to an upgrade program, allegedly in 2001, with improved radar and attack avionics. However, in 2004, Russian media reported that Shenyang co-production of the basic J-11 was stopped after around 100 examples were built, citing a source within the PLAAF suggesting that the basic Su-27/J-11 was no longer meeting PLAAF requirements. The PLAAF later revealed a mock-up of an upgrade J-11C in late 2002. It was equipped with Chinese anti-ship and PL-12 air-to-air missiles presumably for the role for a maritime strike aircraft.